Relax in a casual outdoor setting while enjoying Hawaii Regional cuisine specialties and Hawaiian entertainment. Breakfast Mon.-Sat., Dinner nightly, Brunch Sun. 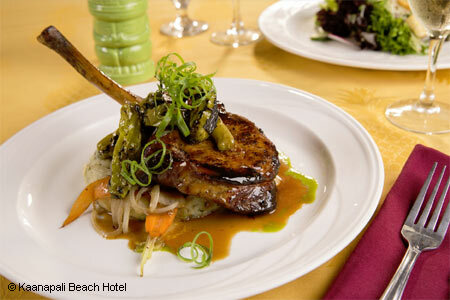 : Chef Thomas Muromoto’s classic Hawaii Regional cuisine is served with a nightly backdrop of Hawaiian music and hula. Try the four-course meal with a creamy baked crab and shrimp appetizer; a simple garden salad; a choice of entrée (we like the Koala lamb chops with papaya mint chutney) and a dessert of molten chocolate cake topped with macadamia nut ice cream, caramelized bananas and whipped cream. Items are also available à la carte. Keep an eye out for the nightly specials, including all-you-can-eat crab legs. For healthier fare, the traditional Hawaiian two-course menu is low in salt and naturally flavored with herbs and spices. The pohole fern and ogo salad is refreshing, however, the entrée, your choice of steamed chicken or fish, may have you reaching for the salt shaker. The Sunday champagne brunch is a local favorite, so be sure to make reservations.